Now that Halloween is like a ghost…we are all starting to think about Thanksgiving. Universal Orlando Resort is thinking the same thing. They are already planning their Thanksgiving festivities at Universal Orlando Resort. Save me the turkey leg! Savor the tastes of Italy at the Thanksgiving Day Buffet from 11 am – 6 pm. Entertainment includes appearances by Universal Orlando characters, kids’ holiday crafts and activities table, face painter, balloonist and live music. Adults $65, Children (ages 3 – 9) $20, under 3 free. Reserve online at OpenTable or call 407.503.DINE (3463). Join The Kitchen for a rockin’ Thanksgiving Buffet from 11 am – 4 pm and 5 pm – 10 pm. Entertainment includes appearances by Universal Orlando characters and Magic Man. Adults $62, Children $22, under 3 free. Reserve online at OpenTable or call 407.503.DINE (3463). Enjoy a Thanksgiving Holiday Buffet among the sights and sounds of the South Pacific from 11 am – 9 pm. Entertainment includes a face painter, balloonist and appearances by Universal Orlando characters. Adults $58, Children (ages 3 – 9) $26, under 3 free. Reserve online at OpenTable or call 407.503.DINE (3463). Join Universal Orlando for a Caribbean-style Thanksgiving Day Buffet from 11 am – 9 pm. Entertainment includes a face painter, balloonist and appearances by Universal Orlando characters. Adults $58, Children (ages 3 – 9) $26, under 3 free. Reserve online at OpenTable or call 407.503.DINE (3463). Kick off the holiday season at our popular food and wine event on Friday, November 24 from 6:30 pm – 9 pm. Enjoy select wines and sparkling wines, expertly prepared gourmet foods and live music, plus the grand illumination of Portofino’s Christmas tree and more on the picturesque Harbor Piazza. General admission $55, VIP $90 (plus tax and ticketing fee). Purchase tickets online at LoewsHotels.tix.com. It’s the season of giving back! Help Universal Orlando accomplish their goal of assembling 375,000 meals for Feeding Children Everywhere. Volunteer for a one-hour shift at Loews Portofino Bay Hotel, Hard Rock Hotel, Loews Royal Pacific Resort, Cabana Bay Beach Resort or Loews Sapphire Falls Resort between 9 am and 1 pm. Click here to sign up to volunteer. The Jones Family actually participated in this event with The Tim Tracker a couple years ago. It was a really fun event for the whole family. If you are visiting Universal Orlando Resort during Thanksgiving or live in Central Florida, you may want to volunteer for this event. 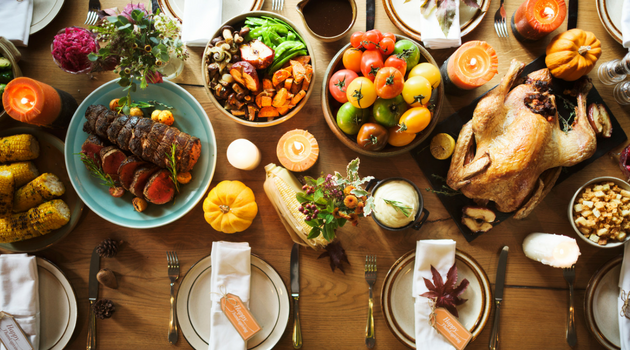 What do you like best about a Thanksgiving Day meal?